Rode Microphones (or shortly “Rode”) is the name of one of the most popular tech brands on the market. These guys were originally named Freedman Electronics, by which they earned their fame in the early seventies, and after half a century of good work, they’ve graced the market with the NT1. Now, the improved variant – the NT1A had cast a shadow over its predecessor, but most microphone enthusiasts still argue about whether newer is truly better or not. We’re here to provide clarity on this issue. It’s safe to say that you can’t go wrong with any Rode model. Simply put, they make their products durable and versatile, and it’s easy to see why most professionals turn to them in their time of need. 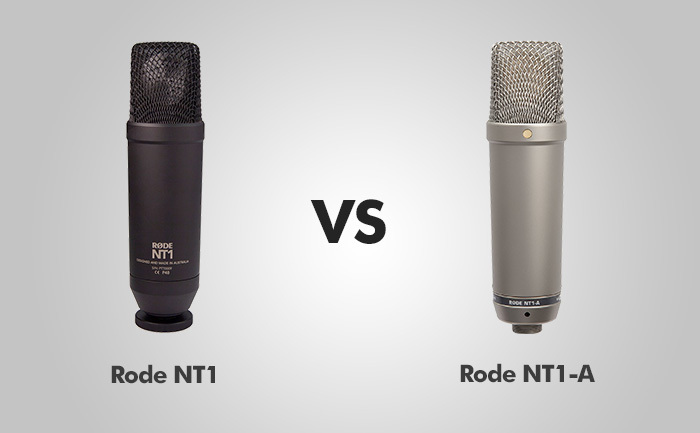 However, NT1 and NT1A are in a completely different league when compared to Rode’s older models. Most people would assume that, given that these two microphones are relatively new, they are more complex, outfitted with sci-fi features and such, but the truth couldn’t be any further from that. Namely, both NT1 and NT1a are simple in nature, as they come with a rather straightforward feature outfit. Despite their simple build, they boast a remarkable, exquisite level of performance, and don’t cost too much in turn. A complete answer to the question “which one is better”, however, can’t be given unless we evaluate their performance thoroughly. Rode’s NT1 features a large condenser capsule laden with a gold-plated membrane, a cardioids polar-pattern, internal Rycote-based shock-mount, JFET impedance converter active electronics hardware. Its frequency range spans from 20Hz to 20 kHz, and its impedance is estimated at 100 ohms. It also features a nearly lightweight design, weighing only 440 grams. Overall, the key features of Rode’s NT1 are pretty great, but that’s not all – you’ll also benefit from RM2 ring-mount mic stand and a drawstring cover. The features of NT1A are quite similar to those of NT1, but there are several striking differences. It features a pressure-gradient acoustic principle, a large condenser capsule, and top-shelf surface-mount electronics. Both the frequency range and output impedance share the same values as with the NT1 (20Hz to 20kHz frequency, 100 ohms impedance), and the active electronics are identical with both models. The NT1A is nearly 100 grams lighter than NT1, though, as it weighs only 326 grams. The NT1A package features an SM6 shock-mount, a 6m XLR cable, and a microphone dust cover made of a premium-quality drawstring. Judging by the features, both NT1 and NT1A come with a superb hardware outfit. Needless to say, these microphones are professional-grade tools which promise quite a lot in terms of quality, but they are de facto different. We’ve set up the battleground and separated it into few smaller segments so that you can get a clearer picture of how good each model is in each sphere. Both NT1 and NT1A belong to the same price point category, but the latter is just a bit more expensive. That’s only normal, given that the improved model (NT1A) comes with additional gratis features and a superior feature outfit. However, this round goes to NT1A, given that the entire bundle costs less than NT1 without the addition of the shock mount and pop filter. Even though both models are decently affordable by professional mic standards, it’s a shame that an improvement over the older model costs less than the original one, dissuading many from even considering it. The frequency range of both NT1 and NT1a seems identical – even the official frequency chart features a straight line which only strays at barely noticeable segments, but it would be incorrect to say that frequency response of NT1 and NT1a are the same. How is that so? Well, NT1 has a flatter profile, which basically means that this model is better for people who are good at manipulating their vocals. NT1A, on the other hand, features an improved lower-end frequency response, allowing for a boost to sound clarity and capturing brighter tones. Again, the round goes to NT1A – even if you’re a true professional who really knows what he’s (or she’s) doing, the frequency response of NT1A is greatly superior to its counterpart. This is the first round where NT1 and NT1a stand at an even ground. Both models are professional microphones, and it’s safe to say that they come with a set of state-of-the-art features which provide impeccable, nearly unprecedented sound quality. Due to the fact that the NT1a has a slightly better low-end frequency response, you might be able to get a clearer, brighter tone from it than you would from NT1, but it’s all a matter of subjective preference and skill in the end. Some people are concerned about how their microphone looks like, and it’s not hard to see why – live performers are usually the “front” which gets the most attention, and a beautiful mic could really be “handy” in such cases. That being said, it would be difficult to label NT1 and NT1a as anything but “beautiful”. Both of these models are quite plain in nature, but they excel in aesthetics nevertheless. The only real difference between these models is the color, even though the NT1a has a neat SM6 shock mount which makes it a bit more attractive. One of the most obvious factors that differentiate these two microphones is the customization potential or the additional gratis features they come supplied with. NT1, for example, comes only with a dust cover and the RM2 ring-mount stand. That’s quite cool, but not nearly as awesome as NT1A’s gratis feature outfit, which numbers the SM6 shock mount, a pop filter, 6M XLR cable, and the aforementioned drawstring dust-cover. Comparing NT1 to NT1A might appear silly, given that an upgrade is almost certain to be better than the original, but this unwritten rule applies to the given situation without fail. Let’s be clear on one point – both NT1 and NT1A are phenomenal microphones, each boasting a remarkable value for the cash. However, NT1A is objectively superior to its predecessor in virtually all segments of performance. It goes without saying that most people would still find the original NT1 as valuable, but there’s little room for doubt that NT1A is superior.